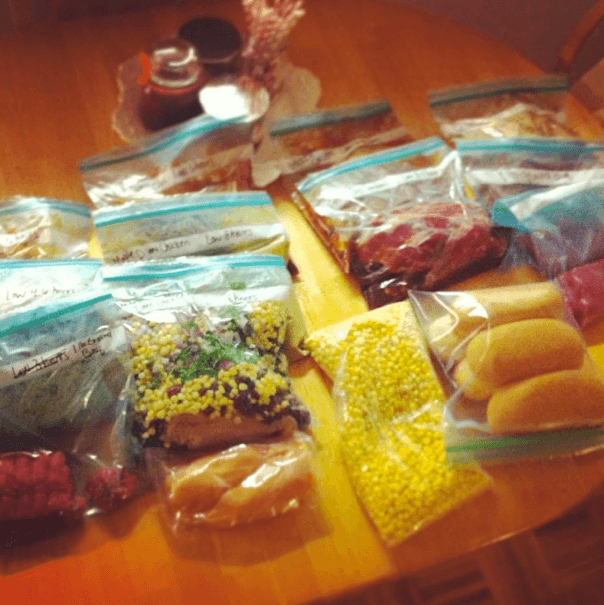 My friend Ashley and I were talking one day and decided it would be worth our time and money to make some freezer meals, especially now that it’s getting cold and we don’t want to have to make as many trips to the grocery store. We started pinteresting, and Ashley found a link to the Six Sisters’ Stuff for 8 freezer meals that you can make at one time. It had the recipes for all the meals and even a shopping list already made to make it extra simple. They were different than most freezer meals I have seen because they were all for the crockpot. I had never made freezer meals before because most of them are casseroles and never sounded especially tasty. But for the most part, these sounded pretty good so we decided to do it! The post by the Six Sisters said it could be done in one hour. Maybe it’s because we had two kids to tend, we doubled the recipes, and we had a small kitchen space, but it definitely took us longer than an hour. But we turned on Christmas music and it was actually a really fun afternoon! I’ll definitely be doing this again! To start off, we went to BJ’s (the knockoff Costco that’s in walking distance) and bought everything that was worth buying in bulk. It helped that we were doing it together and splitting the costs because we could buy in bigger quantities and save money in the long run. You guys should have seen us. It was truly a sight to be seen. Ashley was pushing her stroller with little Brooks, Eva didn’t want to sit in her stroller, so I was chasing after her in the store, and pushing my stroller. We bought so much food. I felt like we were cooking for an army. And since we didn’t have the hands to push a cart, we were piling up all of the food in/on/above/below our strollers. It was madness. But hilarious. We then came back to my place, we put the kids down for a nap, Ashley started dividing the meat, and I went back to the regular grocery store to get all of the food we still needed. From there, after all of the meat was divided, we just went through each freezer meal and assembled them! Sometimes we made mistakes, so let’s hope it won’t affect the meals too much! But in the end, we felt like champions–freezing 8 big meals each (with each meal enough for two days worth for our small families) and having extra meat and veggies for storage! In the end, we only spent about $100 each! That’s quite a deal for good, well-balanced, home-cooked meals! We are trying out the BBQ ribs tonight and Ashley is making the Alfredo chicken tomorrow! I’ll let you know how the meals turn out! I need to make these before Baby #2 comes! Pretty sure these’ll save my life! OOOOooooo! Thanks for posting! I’ve been trying to find freezer crock pot meals since I started working in the evenings. I’m going to have to give these a try. You are superwoman!! Amazing!! I need to do this too!! Not only great comfort food for the winter, but so fun ( and a tender mercy) to have a friend that you can share this experience with). You are blessed so much by Heavenly Father.